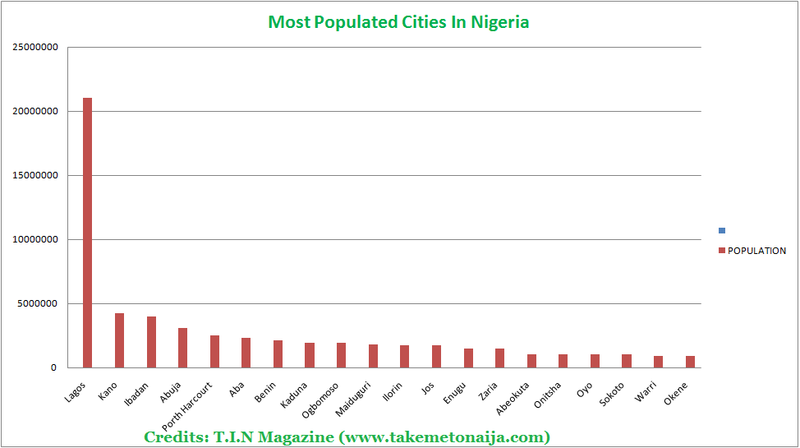 Most Populated Cities In Nigeria 2016. So, a national population census was supposed to take place in Nigeria this year but due to the current economic crisis, the census have been postponed till further notice. 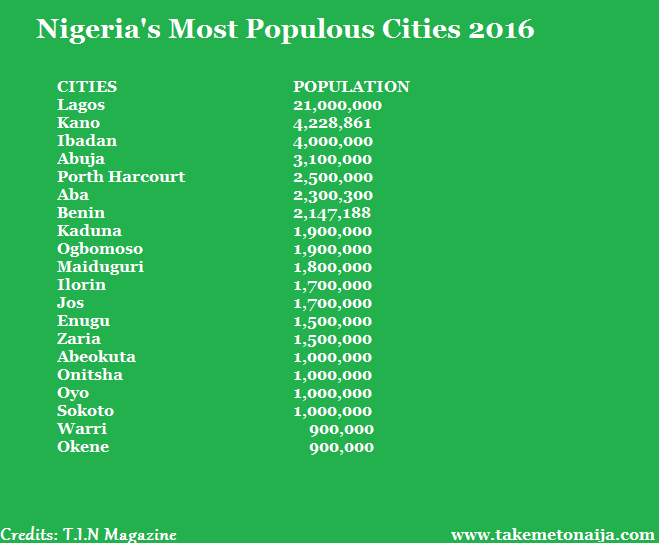 So in the mean time, T.I.N Magazine just like last year have gathered figures from various sources showing Nigeria’s most populated cities. Well, this is an estimation. Lagos has been the most populated city in Nigeria for a longtime, in 2006’s population census Lagos had 7,682,953 but now The population of Lagos according to the Lagos State Government was 17.5 million, a number disputed by the Nigerian Government and judged unreliable by the National Population Commission of Nigeria. The latest reports estimate the population at 21,642,797, making Lagos the largest city in Africa. Officially Lagos is known to be the second fastest-growing city in Africa and the seventh in the world. Our 2016 estimates puts the city’s population at 21,000,000. Abuja is the capital city of Nigeria. It is located in the centre of Nigeria At the 2006 census, the city of Abuja had a population of 776,298, making it one of the ten most populous cities in Nigeria. Abuja has witnessed a huge influx of people into the city; the growth has led to the emergence of satellite towns such as Karu Urban Area, Suleja, Gwagwalada, Lugbe, Kuje and smaller settlements to which the planned city is sprawling according to recent reports and estimates Abuja population is 3,000,000. Our 2016 estimates puts the city’s population at 3,100,000. Port Harcourt is the capital of Rivers State, Nigeria. According to the 2006 Nigerian census Port Harcourt has a population of 1,382,592. The state government have not made any public declaration on the city’s population as of recent, but different estimates have reported Port Harcourt having close to 2 million with an estimate of 1,947,000 as the total population of the moment. Our 2016 estimates puts the city’s population at 2,500,000. NOTE: RANKINGS NOT OFFICIAL, JUST THE RESULT FROM T.I.N MAGAZINE’s RECENT RESEARCH.